Hi, I'd like to make two requests I think would greatly increase readability during gameplay. 1.) Add a second colour palette option for labels so that you may have a different colour for labels and values (like msi afterburners recent change). It's a lot easier on the eyes! 2.) Add advanced hot key toggling for the OSD display so you have the standard on/off for the entire overlay but a second toggle key that will hide specific sensors from the overlay. That way you can show minimal info whilst gaming but at a key press see the more advanced sensors if needed. Ideally in this picture below it would be nice to have the labels a different colour to their values and a toggle key to hide advanced sensors in the overlay such as everything in purple for a more minimalist look. Also if possible, when toggling off sensors you have selected for the secondary toggle key. The overlay would need to collapse or compress the hidden lines so that you dont end up with the same sized overlay and lots of blank space. Note that if Afterburner has some features for OSD that HWiNFO is missing, you can try it the other way - use the HWiNFO plugin in MSI AB to import all sensors from HWiNFO and then setup the OSD using its features. Hmm I didn't even know that was possible i'll check it out but my main reason for checking out hwinfo was to move away from afterburner. 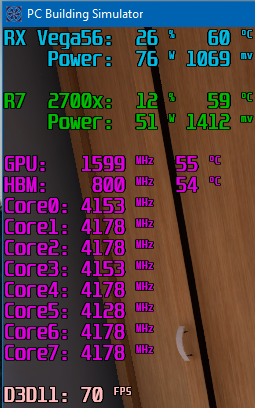 AB doesn't seem to play nice with the vega gpu and its different power states. So I managed to get my desired setup using the plugin method in afterburner which displays the figures with 2 tone colouring. I then use hwinfo overlay with the ability to set which lines the sensors display to which is really cool. I can then toggle the hwinfo toggle key to turn extended information on/off. Thanks for pointing me in the direction of those afterburner plugins Martin!